A regular breeding species and migrant; regular during the winter months with the majority of reports limited to northeastern Minnesota, especially on Lake Superior. An uncommon species during the Minnesota Breeding Bird Atlas (MNBBA). A Holarctic species, in North America the Red-necked Grebe can be found breeding across southern Alaska and western Canada, east to Quebec. In the United States its range dips south into Minnesota, Montana, Idaho, and Washington; isolated populations are scattered also across a few other northern states. The species nests in low densities throughout its range. In southern Canada and the United States, its highest breeding densities are found in the prairie potholes of the northern Great Plains and the Canadian Prairie Provinces (Figure 1). Assigned a Continental Concern Score of 11/20 by Partners in Flight and ranked as a species of Moderate Concern by the North American Waterbird Conservation Plan; designated a Species of Greatest Conservation Need in Minnesota. Short- to medium-distance migrant that winters primarily along northern coastlines. A diver that feeds on aquatic insects, fish, and crustaceans. Breeding distribution and relative abundance of the Red-necked Grebe in North America based on the federal Breeding Bird Survey from 2011 to 2015 (Sauer et al. 2017). In Minnesota, the Red-necked Grebe is on the southern periphery of its breeding range. In the early 1900s Roberts (1932) described the bird as a summer resident primarily in the northern and west-central regions of the state: “It is rather common locally in the northern half of the state but is less frequent farther south.” Confirmed nesting records were reported from 6 counties (Cass, Hennepin, Jackson, Meeker, Otter Tail, and Wright) and Itasca State Park; inferred nesting records (young unable to fly) were available from McLeod and Nicollet Counties. Noting its less frequent occurrence in southern Minnesota, Roberts speculated that the Red-necked Grebe was likely a more common breeder in the region in former times. In the 1936 revision to his book, confirmed nesting records from Ramsey and Wright Counties also were added (Roberts 1936). When Green and Janssen published their updated status account of Minnesota birds in 1975, new nesting records extended the grebe’s breeding range from northwestern Minnesota south through central Minnesota, east to the Twin Cities and south again to Swan Lake in Nicollet County. Outside of this core area, nesting had also been confirmed as far east as Lake Vermilion in northern St. Louis County and as far south as Freeborn and Jackson Counties. Nesting had been confirmed in a total of 33 counties. Despite the plethora of records, there were few breeding records in the far west-central counties of the upper Minnesota River valley. Instead, the core of the species’ distribution appeared to extend from east-central and central Minnesota northwest to the Aspen Parklands. Little had changed when Janssen provided another update in 1987. There were 2 new nesting reports in southern Minnesota: 1 in Steele County (1982) and a second in Lyon County (1986). Janssen delineated a total of 24 counties where breeding had been confirmed since 1970; Hertzel and Janssen (1998) later added another 4 counties to the list. To date, the Minnesota Biological Survey (MBS) has documented 130 breeding season locations for the Red-necked Grebe (Minnesota Department of Natural Resources 2016). No birds were reported in the greater Twin Cities metropolitan region, in northeastern Minnesota, or in southeastern Minnesota. There were nearly 20 records south of the Minnesota River, including 10 in the southwestern region of the state. During the MNBBA, observers reported 296 Red-necked Grebe records in 4.1% (197/4,749) of the surveyed atlas blocks and in 4.1% (95/2,337) of the priority blocks. Breeding evidence was documented in 86 blocks (Figures 2 and 3; Table 1). The birds were detected in 45 of Minnesota’s 87 counties and were confirmed breeding in 32 counties. Fourteen of these counties with confirmed breeding records were additions to the list published by Hertzel and Janssen in 1998; 4 of the new records were south of the Minnesota River valley. Overall, the Red-necked Grebe’s breeding distribution has changed very little in the past 100 years. The species does appear to be more abundant in far west-central Minnesota than suggested by Green and Janssen (1975) and Janssen (1987), and more common in eastern Minnesota than documented by the MBS. It was largely absent, however, from the southwestern corner of the state. Records from south-central Minnesota, especially south of the Minnesota River, have become more common, suggesting the species is either newly expanding to the south or reoccupying areas that Roberts (1932) considered part of its former breeding range. Few data were available to ascertain if the species’ distribution has changed elsewhere within its breeding range. Stout and Nuechterlein (1999) suggested that the range may have extended farther east to Quebec and New Brunswick, but the documentation was poor. To the east, in Wisconsin, the first large colony was reported in 1969 at Rush Lake in Winnebago County, where they have continued to nest as recently as 2016 (Cutright et al. 2006; ebird 2016). Breeding distribution of the Red-necked Grebe in Minnesota based on the Breeding Bird Atlas (2009 – 2013). Summary statistics of observations by breeding status category for the Red-necked Grebe in Minnesota based on all blocks (each 5 km x 5 km) surveyed during the Breeding Bird Atlas (2009-2013). Summary statistics for the Red-necked Grebe observations by breeding status category for all blocks and priority blocks (each 5 km x 5 km) surveyed during the Minnesota Breeding Bird Atlas (2009-2013). The haunts of the Red-necked Grebe during the summer are permanent wetlands with abundant emergent vegetation, and the protected bays and shorelines of larger, deeper lakes where small stands of emergent bulrushes, sedges, cattails, or wild rice are still present (Figure 4). Occasionally the birds nest in bogs or in open-water areas where there are thick mats of submerged vegetation (Stout and Nuechterlein 1999). In Wisconsin, wetlands used for nesting had greater than 25% emergent cover (Brooks 2006). In the southern portion of their range, including Minnesota, Red-necked Grebes are rarely found on waters that are less than 2 hectares in size (Riske 1976; De Smet 1983). Other important features of their breeding habitat include protection from wind and waves, availability of nesting material, access to open water for diving, and suitable cover located a sufficient distance from shore to minimize access by predators (Stout and Nuechterlein 1999). Typical breeding habitat of the Red-necked Grebe in Minnesota (© Lee A. Pfannmuller). Like all marsh birds, the Red-necked Grebe is not well monitored by traditional roadside surveys such as the federal Breeding Bird Survey (BBS). Indeed it is rarely encountered on BBS routes in Minnesota, averaging less than 1 bird on each route each year (Sauer et al. 2017). Population estimates are, therefore, estimates by biologists most familiar with the species. Biologists with Wetlands International estimated that the Red-necked Grebe’s global population ranges from 193,000 to 287,000 breeding adults; their estimate for the North American subspecies, Podiceps grisegena holboellii, was 45,000 (Wetlands International 2015). Stout and Nuechterlein (1999) believe this estimate may be too low, as birds recorded in aerial surveys in the western Northwest Territories in the 1990s alone exceeded 20,000. A recent assessment by Partners in Flight (2017), however, estimated the global population only numbers 160,000 birds. Despite its limitations, the BBS is the only source of large-scale population data available for the breeding season. The general challenge of using BBS routes to adequately survey marsh-inhabiting species is further complicated by the relatively low abundance of the Red-necked Grebe, which results in statistical analyses with poor precision. The only two ecological regions where the species is encountered frequently enough to accurately assess population trends are located in far northwestern Canada: the Northwestern Interior Forest and the Boreal Taiga Plains. In the former the Red-necked Grebes show a significant decline; in the latter their population is stable. Although the data have limitations, across the BBS area the population is relatively stable and may have increased beginning in 2005 (Sauer et al. 2017). The only other range-wide data available for the Red-necked Grebe are from the National Audubon Society’s annual Christmas Bird Count. Again, these counts do not adequately survey species like the Red-necked Grebe that spend winters in coastal waters. All the Christmas Bird Counts combined, in both Canada and the United States, have counted an average of only 3,100 birds per year from 1966 to 2015 (National Audubon Society 2015a), yet the North American population numbers at least 45,000 birds. 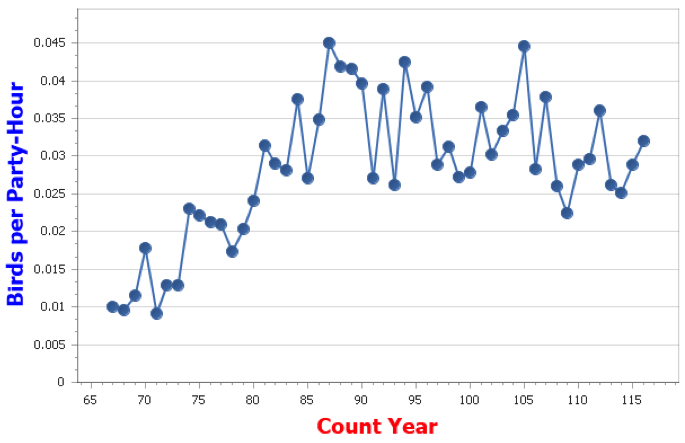 Over time, however, the number of grebes observed per party-hour has increased (Figure 5). Number of Red-necked Grebes reported on Christmas Bird Counts in the United States and Canada, 1966–2015 (National Audubon Society 2016). Little conservation attention has been focused on the Red-necked Grebe. The North American Waterbird Conservation Plan (2006) considered it a species of Moderate Conservation Concern. It also has been assigned a moderate Continental Concern Score of 11/20 by Partners in Flight (2017). Although populations are considered stable, one of the major factors that led to this status was concern that significant threats exist in the grebe’s nonbreeding habitat. The coastal waters where Red-necked Grebes spend each winter are considered to be the major source of contaminants that have been found in adults, young, and eggs (Riske 1976; De Smet 1987; Forsyth et al. 1994). Oil spills in coastal waters also are believed to impact adult mortality. Although it is not state listed in Minnesota, the Red-necked Grebe is designated a Species of Greatest Conservation Concern (Minnesota Department of Natural Resources 2015). Habitat conservation efforts focused on wetland protection, restoration, and management should benefit the Red-necked Grebe. In Minnesota, numerous programs are focused on wetland conservation. Goals established for grassland and wetland protection by the Minnesota Prairie Landscape Conservation Plan (Minnesota Prairie Plan Working Group 2011) are an excellent example of the scale of the work that needs to be undertaken in the western regions of the state to provide needed protection to a suite of wetland-dependent species. Even with broad-scale conservation efforts, warming temperatures may pose a significant threat to the Red-necked Grebe in the long term. An analysis conducted by the National Audubon Society on nearly 600 North American birds predicted the species could lose more than 90% of its current summer breeding range by the year 2080, potentially forcing a dramatic northward shift during the summer months. The species was classified as a “climate endangered” species (Langham et al. 2015; National Audubon Society 2015b). In the near term, site-level management recommendations focus on the importance of maintaining a diverse community of emergent vegetation that provides a minimum cover of 25% (Brooks 2006). Managers in Wisconsin recommended focusing restoration on wetlands that are at least 4 hectares in size and more than 20 cm deep. Maintaining stable water levels throughout the nesting season is critical (Mueller 2013). Because Red-necked Grebes frequently nest in the shallow bays of large lakes that receive heavy recreational use, minimizing boat traffic in nesting areas during the breeding season can reduce disturbance and the impacts of boat-induced wakes that can swamp nests (Stout and Nuechterlein 1999). Brooks, William. 2006. “Red-necked Grebe.” In Atlas of the Breeding Birds of Wisconsin, edited by Noel Cutright, Bettie R. Harriman, and Robert W. Howe. Waukesha: Wisconsin Society of Ornithology, Inc.
De Smet, Ken D. 1983. “Breeding Ecology and Productivity of Red-necked Grebes in Turtle Mountain Provincial Park, Manitoba.” MS thesis, University of North Dakota, Grand Forks. De Smet, Ken D. 1987. “Organochlorines, Predators and Reproductive Success of the Red-necked Grebe in Southern Manitoba.” Condor 89: 460–467. Forsyth, Douglas J., Pamela A. Martin, Ken D. De Smet, and Morley E. Riske. 1994. “Organochlorine Contaminants and Eggshell Thinning in Grebes from Prairie Canada.” Environmental Pollution 85: 51–58. Riske, Morley E. 1976. “Environmental and Human Impacts on Grebes Breeding in Central Alberta.” PhD diss., University of Calgary.